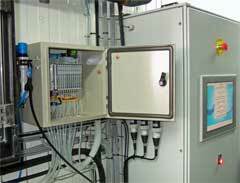 This control box is used to control pneumatic valves. It also detects air presence and controls air quality. Produced in several lines depending on the number of valves to control. Available for 6, 10, 18, 20, 24, 30 Solenoids. 300 x 300 x 200 mm for 6,10, 18, 20, 24 solenoids. 500 x 500 x 210 mm for solenoids. * 1 island of 3/2 NC manifolds. * Ø 6 mm instant output fittings. * 5 metre long multi-pole cables.